Great Britain Cycling Team’s Bethany Shriever crashed out of the junior women’s final at the UCI BMX World Championships in the cruellest fashion. The 17-year-old was magnificent as she won all her races through the motos and semi-final to reach the final eight in Medellin, Colombia. But a mistimed effort on the opening jump saw time trial silver medallist Shriever fall to the floor of the Mariana Pajon BMX Track. Dutch rider Ruby Huisman went on to cross the line first to take the rainbow jersey. Liam Phillips exited in the semi-finals in a heat that also saw Olympic champion Maris Strombergs and London 2012 silver medallist Sam Willoughby knocked out of the competition. 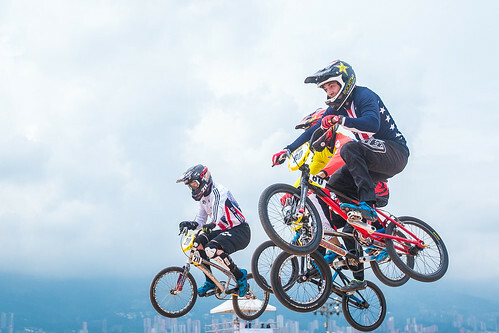 As one of the top 16 UCI ranked riders of 2015, Phillips entered the event at the 1/8 final stage but a third place finish put the 27-year-old against the odds as he was forced into difficult gates. A strong start and intelligent ride for second in the quarter-final booked Phillips a place in the last 16. Starting in gate five, Phillips was in the mix for a top-four spot but dropped back on the third straight and was forced to settle for fifth. “Unfortunately I made a small mistake in the first race, one jump, and yesterday I alluded that it was going to be case of making no mistakes,” Phillips said. Unlike Phillips, Kyle Evans started is day in the motos. Second, third and second over the three runs secured a place in the 1/8 finals, where it looked as if the 22-year-old’s day would end after a slow start. But a crash handed Evans a lifeline and he took fourth to move into the quarter-finals, where a less than ideal start saw Evans on the back foot, taking seventh as only four moved through to the next round. Phillips and Evans will now turn their attention to the Rio Olympic Games in August while first-year junior Shriever can build on an encouraging season to date, which has also seen her reach the semi-finals of the UCI BMX Supercross World Cup in Manchester.